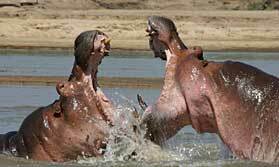 Nkwali Camp is run by Robin Pope Safaris, one of the best-known companies in Zambia. 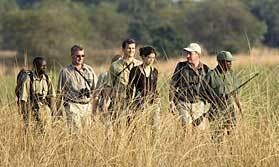 The team specialise in walking safaris, photographic safaris, night drives and private safaris for families. Nkwali Camp is located on Robin Pope Safaris' private land in Mfuwe, overlooking South Luangwa National Park and for many years was the home of Robin and Jo Pope. 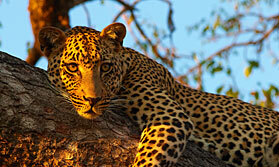 The land is superb game viewing country, with a beautiful area of ebony woodland and open grasslands. Elephants regularly cross the Luangwa or come to the waterhole near the thatched dining room, and the area is famous for leopard and giraffe sightings. Nkwali Camp offers a luxury wilderness experience with stylish accommodation in 6 beautifully-furnished, spacious rustic thatched cottages, all overlooking the river, with ensuite bathrooms with flush toilets. There is a bar, built around a huge ebony on the river bank, and excellent food is served in the dining room. Nkwali Camp also has a small swimming pool. At the edge of Nkwali Camp is Robins House. This is a private house is ideal for families, honeymooners and guests looking for a little privacy. There are two luxury ensuite bedrooms, a central sitting room and dining room and a private kitchen and chef, along with a valet. 1km from the camp is Luangwa Safari House, which can accommodate up to eight guests in four large ensuite bedrooms, and has a massive living area and a pool. The superstructure of this stunning house is twenty five ancient and weathered leadwood trees. Children staying at Luangwa Safari House can enjoy special activities, and there is a child minder available. Guests at Nkwali Camp can also spend a night in a traditional mud hut at Kawaza which is a community supported by RPS in Nsefu Village. Accommodation and food is totally African. There is the chance to meet the Chief, a local traditional healer, to spend a morning with the ladies collecting water and cooking, to help with village chores - ask us for details. Location: Nkwali Camp overlooks the South Luangwa National Park, on the banks of the Luangwa River. Rooms: There are 6 open fronted stone and thatched chalets, all with ensuite bathrooms with flush toilet. At night, large mosquito nets are lowered to cover the beds, whilst bamboo and metal shutters are drawn across the front of the room to keep out unwanted visitors. 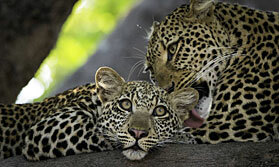 Activities: Activities include day and night game drives, nature walks, bird watching and bush picnics. The camp can also arrange boat trips for game viewing and to enjoy sundowners, as well as canoeing and fishing. Facilities: The central main building includes the bar, library and large deck overlooking the river. There is also a swimming pool with sun loungers. The dining area is beside the camp's waterhole. Dining: Meals are taken as a group, either in the dining room or the outside deck area. Children: Children aged 7 and over are welcome. Children must be kept under supervision at all times. Communication: There is mobile ‘phone reception' at the camp. Robin Pope Safaris' famed walking mobile safari in South Luangwa, Zambia. Nkwali belongs to Robin Pope Safaris. They are an award-winning company in terms of responsible tourism. They believe in benefiting the wildlife, environment, the people who work for them and their neighbouring communities. To this end they back projects which alleviate poverty in their region, and help with the education and health of local communities and staff. They are keen supporters of the Zambian Carnivore Programme in South Luangwa, as well as the anti-poaching units of the South Luangwa Conservation Society. All their camps use green technology wisely to minimise environmental impact, for example solar power, green roofs and water conservation techniques. Tribes has worked with RPS for years, and we know that they deserve their many awards. "Very special place. Plenty of frogs for company in the bathroom!" "Vrery comfortable, delicious food and great guides. I loved the comfortable chairs at the edge of my chalet looking out towards the river." "Friendly camp with great staff, wonderful atmosphere and everything you would expect for the perfect safari experience." "This camp had possibly the best bedroom on my trip. I loved waking up in the morning and from my bed I could see the impressive Luangwa River in all its glory. The staff, food and guides here were great, and I loved the pontoon crossing over the river into the park, it made for an exciting start and finish to the game drives. Victor, my guide here for a few days, was brilliant! Not only knowledgeable and professional but his stories are borderline hilarious. I would go back just to hear more! " "Top notch service all round. Very professional. We were made to feel very comfortable and nothing was too much trouble. Food, accommodation and staff could not be faulted and the bush breakfast was a very pleasant surprise."